Press Release:-New Delhi, India :- Line Scan Camera India is india's No.1 Manufacturer of high speed line scan camera as commercial products. The company designs, develops & manufacture wide range of Analog Line Scan Cameras, Cameralink Line Scan Camera, LVDS Line Scan Camera, GigE Line Scan Camera & Digital Line Scan Cameras. With strong in-house R&D & design efforts, our camera lens are developed with optimal precision techniques & comes with very low distortion & produce high quality images. Our camera lens are actively implemented in variety of applications like in FA/Machine Vision, ITS/Surveillance & Medical Imaging Applications & many others etc. Key Features: • Our Line Scan Cameras are designed with latest technology & offers ultra high performance. 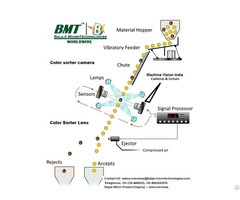 • Our Line Scan Cameras are ideal choice for various line scan application like Fast moving and High speed inspections like colour sorting machine, paper inspections, web inspections, ceramic tiles, wood, print inspections etc. 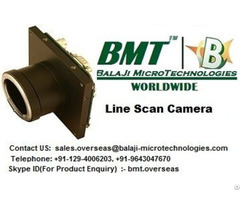 Business Description: BalaJi MicroTechnologies (BMT) is India's No.1 Manufacturer of wide range of high speed Cameralink line scan camera, Analog Line Scan camera, GiGE line Scan cameras etc.